I found this thrifted cake stand when I was out and about looking for Christmas presents last month at my favorite thrift store. This cake stand is an oldie but a goody and I wrapped it in about 10 layers of newspaper to bring it home, threatening my children with instant death if they even looked upon it. I’ve been searching for one of these for a long, long time. Not so much because I have freshly made homemade cake on the counter for my kids when they get home from school, but because there are fewer things more beautiful than a nicely accessorized cake dome. I filled it with Christmas tree ornaments over the holidays and have great plans for it in the coming months, of which I will surely keep you appraised. Found anything good lately yourself? 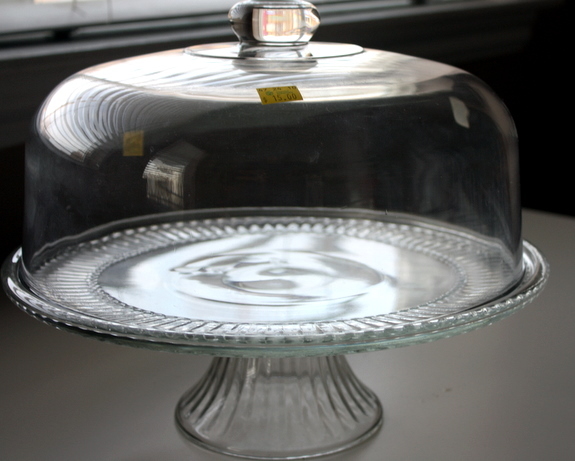 I have my granny’s glass cake dome, it’s one of my favorite things. I love that one and you got a STEAL for $15~!!!! Oh how special to have your grandmother’s cake dome, I love that. A great find! I was just wishing for one of these the other day when I made a cake. I asked myself why I have never gotten one of these. Why self? Why? You’ve inspired me. :) Have a great weekend. Self, you need to get one of those asap. 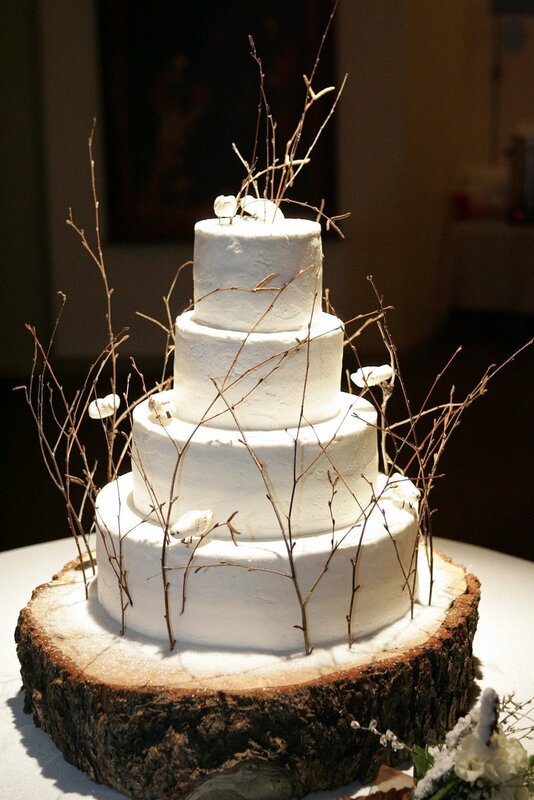 I have a similar cake stand – turn it upside down and it can be a punch bowl too. :) But I got mine at Bed Bath & Beyond with a gift card from my wedding. lol. I don’t do much shopping, so I haven’t found anything good – but I’ll probably be doing my baby shopping at thrift/consignment stores to start out. I did MOST of my baby shopping at thrift stores and found some really cool stuff, it’s a good way to go. I’m always on the look out for Pyrex, cake plates, recipe books, aprons and typewriters. There are lots of cool antique shops in New England (thank goodness). Typewriters! There’s something I haven’t found in… well….ever. I’d like one. I’d give my right arm to go thrifting in New England, truly. I have a similar one, too! Only $8 (with coupon) at BBB: http://www.bedbathandbeyond.com/product.asp?SKU=11716156. Now I’m craving cake! Mercy, you shouldn’t have shown me that. p.s. I’m always craving cake. I want a pretty cake dome. you better hope I don’t come to utah. yours might disappear. I’ll trade you a cupcake stand for a cake dome. I love thrift store shopping. I got a gravy boat right before Thanksgiving for $2. $2! Seriously…. I also wanted to share my new all-time favorite cake stand. I’ve been looking for wedding ideas and recently came across this one. It’s a tree stump! Whoever thought of that is AMAZING. That tree stump is gorgeous, I love that. My comment is a slight duplicate of a few other comments already up. Unless you can find a symbol indicating otherwise, your EXACT cake stand is $10 at Target. I have one and it’s my favorite “cheap but nice” wedding gift to give (my MIL got one for Mother’s day last year). I don’t see it on Target’s website, but it’s just like the Bed Bath and Beyond one that was linked up above, but smooth and clear like yours. So, for all the cake dome lovers, if you want it fluted, go to BBB (I’ve also seen it there smooth) and if you want it smooth, check out Target! Only $10! It’s alright, I don’t feel peed on. I love the multi-purposeness of a cake stand/punch bowl, although I’d use the punch bowl but once a year. I mean, that’s just fancy. I’ve always wanted to go in there, but I never had. Do it and let me know what you think. The Target one mentioned above is made by Anchor Hocking (sp)? I got it back before Thanksgiving and I LOVE it. It has some character to it and it displays all of my homemade bundt pound cakes beautifully. Homemade bundt cakes. Of course. What a great find/idea. Love that! I’m such a treasure hunter. Half the fun is the hunt isn’t it? I am obsessed with thrift shopping, especially for dishes. Great find! We need to make a day of it. Kami from No Biggie is a huge thrifter too and we’ve been wanting to do an all over Utah day. Let’s do it! 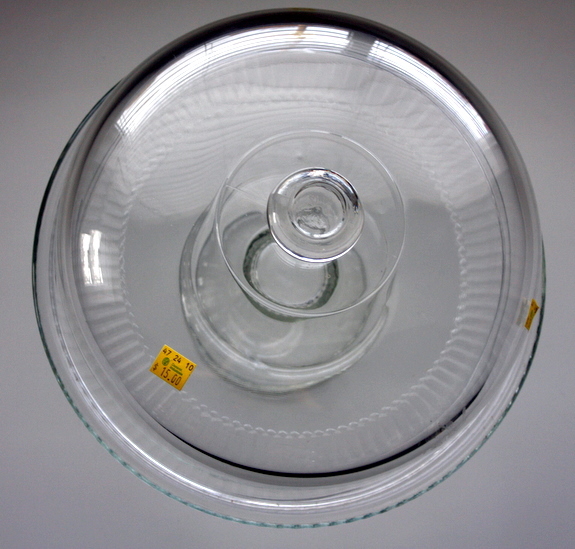 I found some gorgeous mid sized crystal lettuce leaf salad bowls for 50c each! I spotted them then looked around self consciously to be sure no one else was swooping in the grab them too! I’ve gotten a little aggressive before thrifting. It’s okay, embrace it. Love it.